James M. Shuart Stadium is an 11,929-seat multi-purpose stadium and sports facility on the campus of Hofstra University in Hempstead, New York. First opened in 1963, and remodeled in 1996 and 2013, it was known as Hofstra Stadium until August 29, 2002, when it was renamed after the former president of Hofstra University, who played lacrosse and football during his undergraduate years at the school. The stadium grounds include James C. Metzger Hall which houses the stadium's press box, luxury suites and the Fried Center for Student-Athlete Development. It is the home field of the New York Cosmos soccer club of the North American Soccer League, the New York Lizards of Major League Lacrosse, and the Hofstra Pride lacrosse team of the NCAA. Shuart Stadium has held numerous sports and events over the years, including football, lacrosse, and soccer. It has welcomed many teams from different leagues throughout several decades. In 1971, the stadium hosted the inaugural NCAA Division I Men's lacrosse championship game. It has also served as the site for two quarterfinal games of the 2009 tournament, as well as numerous conference championship contests for Women's Lacrosse. The New York Lizards used the facility as their home field for part of the 2001 season and the full 2002 season. During their first year, they became the inaugural Major League Lacrosse champions. The team returned in 2009 and have since called the stadium their official home. The original New York Cosmos played at the stadium between 1972 and 1973. They won their first NASL Championship at the stadium in 1972. The new Cosmos began playing there in 2013. Shuart Stadium also played host to the most recent United States men's match in New York state, when the U.S. hosted Ecuador in a friendly match on November 30, 1984. Shuart Stadium was also the venue for the Long Island Rough Riders of professional soccer's A-League. For nearly five decades, the stadium was home to Hofstra's football team. The team played in the Colonial Athletic Association conference. They utilized the stadium from its opening until 2009 when the program was retired. 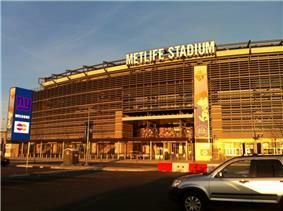 On November 4, 2009, the New York Sentinels of the United Football League played a home game at the stadium. Both the Long Island All-Star Football Game and the Fun City Bowl, featuring the New York City Police and Fire Department teams, have been held at the site. The facility is used for three nights every October for the annual Newsday Marching Band Festival where selected Long Island high schools perform in an exhibition-style competition. 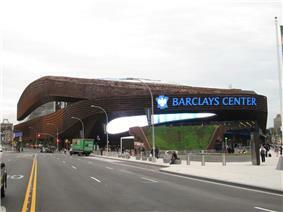 Various Long Island high school and New York state championship games for different sports are also held at the site. Originally built in 1962 and opened in 1963, the stadium has received a number of upgrades. In 1968 a new artificial playing surface was installed, making the stadium the third college facility in the nation to receive one. A major expansion was completed in the fall of 1996. The capacity had been raised from 7,000 to approximately 13,000, while the Howdy Myers Pavilion and new scoreboards in both end zones were constructed. In 2007, the artificial turf was replaced with FieldTurf which was again replaced in late 2012. Then in 2009 new scoreboards were installed in the north and south end zones. More recently, in 2013, the facility was renovated and reconfigured to its current capacity of 11,929. The collective work transformed James M. Shuart Stadium into the largest outdoor sports and entertainment complex on Long Island. In late 2013, new lights designed by Musco Lighting replaced the original lights in the stadium that dated back to 1963. ^ Big Apple Soccer. "Hofstra's Capacity". Big Apple Soccer. ^ Hofstra University. "Hofstra University names James M. Shuart Stadium" (PDF). Hofstra University. ^ Hofstra Athletic Communications. "James M. Shuart Stadium". Hofstra University. ^ Syracuse, Princeton, Cornell, and Maryland coming to Hofstra for NCAA lacrosse, Hofstra University, May 2009.